Need a job? Think Texas. A donut house in Blaine TX is hiring at $18.50 per hour and having trouble. Unemployment rate in Midland is 3% and anybody who wants to work will find a job – all energy related. This startling assertion is put forth by Mish Shedlock and supported by this graph from raw BLS data below. 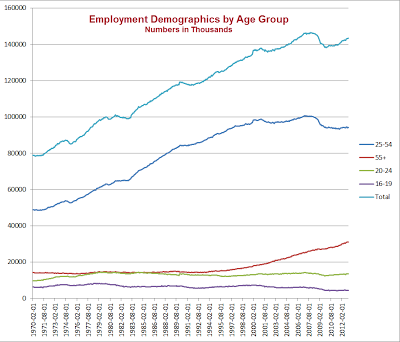 Note the red line, of over-55 workers in the labor force, is the only one rising. In my October client letter, I had discussed how more and more Americans were delaying retirement, by choice or necessity, causing the over-65 demographic to be the fastest growing segment of the labor force. But this new set of data is remarkable and speaks to the true depth of the persistence of the unemployment problem for the majority of those in labor force, whether they are just getting out of school or are in mid-career. According to this Bloomberg Businessweek article, Wall Street banking is no longer the place it once was for young people seeking thrills and maximum risk-taking. I take this as unalloyed good news. Perhaps we will see a shift in the coming decades of the best, the brightest and the most ambitious going instead into fields that provide more social and economic return, say the sciences for one, than what should be the rather dull field of moving monies and risk from one pocket to another. • Forty-five million Americans (one in seven) are on food stamps. • One in seven is unemployed or underemployed. • The percentage of those out of work defined as long-term unemployed is the highest (42%) since the Great Depression. • 54% of college graduates younger than 25 are unemployed or underemployed. • 47% of Americans receive some form of government assistance. • Between 2007 and 2010, median family net worth fell nearly 40%, while median inflation-adjusted incomes before taxes fell nearly 8%. Nearly four years after the Lehman Brothers collapse, this does not make for a pretty picture. And I abbreviated the list in an act of weekend mercy. MSNBC reports on this Georgetown University study of job prospects for new college grads by various majors. 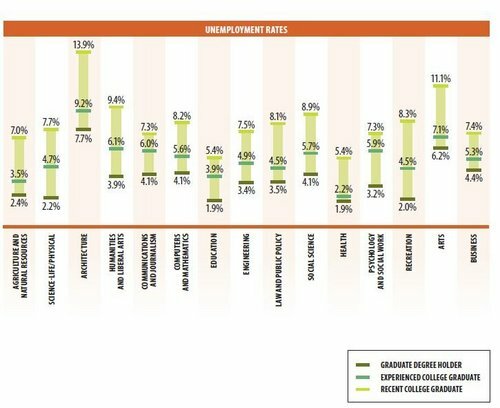 Best majors for finding a job out of college, according to the Georgetown researchers: Education, Health, Life Sciences, Agriculture and Natural Resources. According to the study, between the second quarter of 2009, when the recovery began, and the fourth quarter of 2010, national income rose by $528 billion, with $464 billion of that growth going to pretax corporate profits, while just $7 billion went to aggregate wages and salaries, after accounting for inflation. A principal reason this economic recovery has been so anemic compared to prior recoveries has been a lack of end demand. A lack of employment causes a lack of demand, which in turn causes a lack of new employment to meet that demand. The employment situation thus remains stuck in a vicious circle that has yet to be broken. Take a bunch of 3 year olds from poor families. Randomly divide them into two groups, and give one group free access to preschool. Then follow both groups for 40 years. This is what the researchers in the Perry Preschool Program did, starting in the early 1960s. The results were astonishing. Kids from the preschool group were less likely to be arrested and more likely to have a job. Among those with jobs, those who went to preschool made more money than those who did not. According to this recent Planet Money podcast, most adult job-training programs are a waste of time and money. What does have a huge payoff, particularly for under-served communities? Preschool. James Heckmann, University of Chicago economist, is interviewed about his “rediscovery” of a ground-breaking study that began in the 1960s. According to Heckman, and a recent article in Science magazine, the results and cost-effectiveness of preschool intervention are convincingly demonstrated in multiple studies. So why, as a nation, are we not making that commitment, at a time when job and employment should be at the top of our national priorities (see yesterday’s post)? I put it down to the nature of public discourse today, defined by voter/consumer/investor need for instant results – and the natural response by politicians and companies to provide same. Imagine for a moment a Mayor/Governor/Congressperson/President having to wait 20 years or more to point to the payoff of an investment in pre-school education? Behaviorists call this “present bias” (or simply impatience) and it leads the average person to over-value short-term rewards to the detriment of longer-term payoffs. The widespread failure to adequately save for retirement or address our dependence on foreign oil are two examples. “A bird in the hand is worth two in the bush” I guess. Market failure is a contributing issue. In his current Investment Outlook, bond king, Bill Gross, takes the public, the political class and the media to task for focusing on the wrong crisis. The U.S. is untrained, underinvested and overindebted relative to our global competitors. I’d have a shovel in the hands of the long-term unemployed from 8AM to noon, and from 1PM to 5PM, I’d have them studying algebra, physics and geometry.